When talking about building muscle, many people place all their focus on protein. This results in a diet full of chicken, beef, fish and eggs. While protein does play a vital role in muscle recovery and growth, carbs are crucial too. One way you can increase your carbs in a healthy way to build more muscle is to add more pasta into your diet. Athletes and those with an intense training schedule should consume 2.3 to 3.6 grams of carbs per pound of body weight each day, according to the Academy of Nutrition and Dietetics. Bodybuilding nutrition coach Chris Aceto goes along with this, giving a figure of 2 to 3 grams per pound, adding that a 200-pound bodybuilder needs somewhere between 400 and 600 grams of carbs per day to build muscle. Per 100 grams, regular pasta, such as whole-wheat spaghetti, delivers around 75 grams of carbohydrate when weighed dry. In practical terms, that's 37 grams of carbs for every cup of cooked spaghetti. Sports nutritionist Nancy Clark recommends pasta in addition to other carbohydrate sources such as bread, cereals and oats. It is an easy way to increase your carb intake and meet your daily quota. 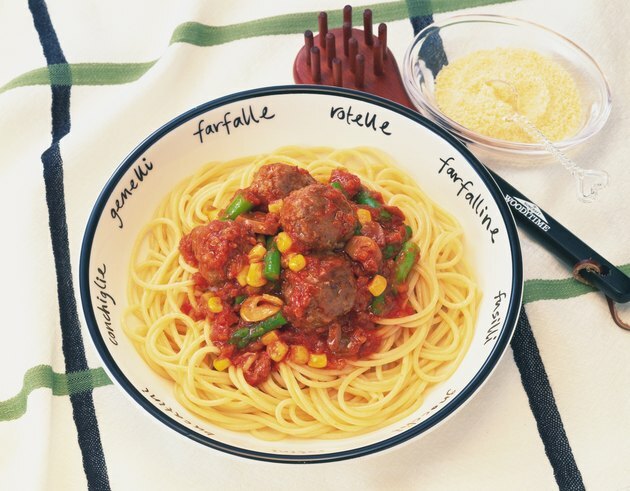 Pasta isn't purely carbohydrate. It also contains protein -- around 15 grams per 100 grams of dry pasta or 7.5 grams protein per cup of cooked spaghetti. The Academy of Nutrition and Dietetics lists whole grains as a good source of protein for vegetarians. The only downside is that the protein in pasta isn't complete; it lacks certain essential amino acids, so you shouldn't rely on it for all your protein needs. Adding pasta into your diet or replacing another carb source in favor of pasta won't immediately lead to new muscle gains. To build muscle, you must eat more calories than you burn. Therefore, if you're currently undereating in terms of calories or carbohydrates, adding pasta into your diet to boost your calorie and carb intake could be particularly useful and help you bulk up. Make your pasta dishes high-calorie but healthy by using tomato- or vegetable-based sauces, adding lean meat or low-fat cheese and drizzling olive oil on top if you need extra fat. Muscle &amp; Fitness: Which Breads Are Best for Bodybuilders? Is Pasta a Good Diet Food? Is Pasta a Good Source of Carbohydrates?